THE TRUSTEES OF CEDAR GROVE CEMETERY INVITE YOU to donate to the Gilman Chapel Restoration Fund. Cedar Grove Cemetery is celebrating its 150th Anniversary with this restoration project for the historic Gilman Chapel. The preliminary work (Phase I) included repair of the slate roof, gutters and masonry, to be followed by substantial interior restoration (Phase II). We are asking your financial support for the second phase of this project, to incorporate the restoration of stained glass windows and renovation of the interior, for use by the public for various events. We are sure you are aware of the important role that the Cedar Grove Cemetery has in the community. A non-profit organization, the Cedar Grove Cemetery is much more than “A Quiet Place by the Banks of the Neponset River.” It is the final resting place for cherished family members and friends. It is also an historic resource, and a focal point for the community. For more than twenty-five years, the Friends of Cedar Grove Cemetery has sponsored memorial services at the historic Gilman Chapel on the Sundays before Memorial Day and Christmas, in memory of all who rest at the Cemetery. This special event also features a one-half hour guided tour of different sections of the Cemetery following the services. Through our Sesquicentennial (150th Anniversary) Capital Campaign, we hope to expand on the number of community events and services held in the historic Gilman Chapel. On Memorial Day of each year — and for more than fifty years — exercises are held to honor all deceased military men and women, and to support our active troops. The seven Dorchester AMVETS, VFW, and AMERICAN LEGION Posts parade into the Cemetery in full formation. They place memorial wreaths, play taps, fire a 21-gun salute and listen to patriotic music. Many high-ranking political and military leaders have been featured speakers at this event; hundreds of people participate in the ceremonies. We humbly ask for your generous support to our Sesquicentennial (150th Anniversary) Capital Campaign. 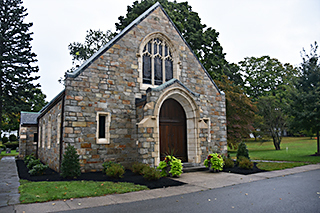 Our goal is to raise $300,000 toward our capital expenditures for the Gilman Chapel Restoration. Without the continued support of generous donors like you, this restoration will be less than is required. Can we count on you to make a donation to this important cause? By making a tax deductible donation to our capital campaign, you’ll be directly contributing to a precious community resource. Additionally, you and/or your loved ones will be memorialized for your generosity as a capital campaign supporter, inside the entrance of the Gilman Chapel. Cedar Grove Cemetery is depending on your assistance and generosity. Please be assured that your contribution will be put to good use to protect and preserve the noted Gilman Chapel, an historic focal point in our community.